Dorian West says Kahn Fotuali’i could be out for a couple of weeks with the shoulder problem he sustained in last Saturday’s win against Harlequins. 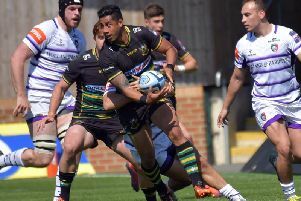 Fotuali’i picked up the injury in the act of scoring what proved to be a match-winning third try for his team in their 30-25 triumph at Twickenham. He was forced off with eight minutes to go, with full-back Ben Foden covering at scrum-half for the closing stages of the game. And the Samoan star could now miss Friday’s Aviva Premiership game against Newcastle Falcons at Franklin’s Gardens. “It’s still early days on that,” said West. “He’s had some X-rays and some scans and we need to speak to some people about the best way of getting him back as soon as possible. Courtney Lawes could return to the Saints squad after missing last weekend’s clash with an ankle injury, but Jon Fisher (foot) remains sidelined and Dylan Hartley is suspended until January 12.